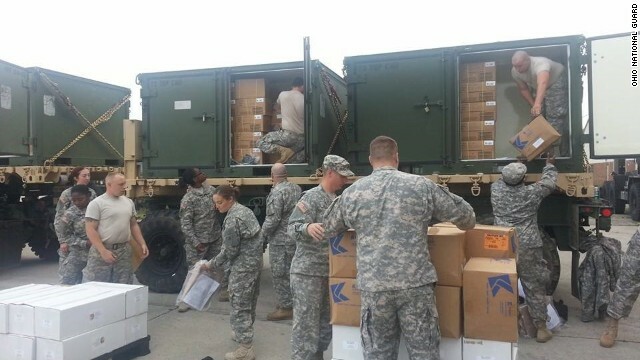 Ohio National Guard soldiers prepare to deliver water to Toledo residents after toxins were found in the city's water supply. Israel agrees to a cease-fire, but Hamas does not. An American doctor infected with Ebola is improving. And a major Ohio city has no drinkable water. Tackling an outbreak: An American doctor infected with Ebola is making progress a day after he arrived in Atlanta from Liberia, where he contracted the deadly virus. Kent Brantly is one of two Americans suffering from Ebola - the second one, fellow missionary Nancy Writebol, is scheduled to land in Atlanta tomorrow. Guinea, Liberia and Sierra Leone continue to scramble to combat the disease, which has killed more than 700 people in those nations. Will new cease-fire hold? : Israel's military says it has agreed to a seven-hour humanitarian cease-fire starting this morning. But a spokesman for Hamas says it's a no go. Previous cease-fires have unraveled. Will this one get off the ground amid the raging violence? 400,000 told not to drink: A major Ohio city is still without drinkable water for a third day after officials discovered a toxin in the supply. Residents of Toledo are awaiting word on when their water will be safe to drink. Mayor D. Michael Collins says tests are taking longer than expected. Narrow escape for U.S. spy plane: A U.S. Air Force spy plane evaded an encounter with the Russian military on July 18, just a day after Malaysia Airlines Flight 17 was downed by a suspected surface-to-air missile. The RC-135 Rivet Joint fled into nearby Swedish airspace without that country's permission, a U.S. military official says. Manhunt ends a year later: A massive manhunt started more than a year ago when a California man allegedly killed his family ended yesterday. Authorities found the remains of Shane Miller, the prime suspect in the deaths of his wife and two young daughters. His remains were found not far from where his truck was located in Petrolia, California, last year. The case was recently featured on CNN's "The Hunt with John Walsh." Here's a happy video for you to enjoy, from CNN affiliate KUSA! Where are the funny videos today? Thanks for your note. We apologize that the funny videos were not included today. Find lots of fun ones at http://www.cnn.com/video, and search for "Distractions." You'll see lots of fun videos for your day. Check back with us tomorrow, and hopefully, the fun videos will be included again. I applaud and respect John Walsh for his determination and drive in seeing bastards brought to justice for the heinous crimes they have committed. For the love of his murdered son whom I will always remember. We're so very sorry for your loss, Margaret. You always present such an upbeat attitude in your posts, regardless of the pain you have suffered. Thank you so much for your kind words for John Walsh. CNN is proud to have him on our network, and we equally applaud our viewer who are making a difference for those wanting justice. For more about "The Hunt," visit http://www.cnn.com/thehunt.